The June 12, 2003 issue of our archdiocesan newspaper is now on-line. Or should I say our award-winning archdiocesan newspaper. This issue discusses the recent sale of the former Cudahy St. Joseph Parish buildings in this article. "All appropriate consultations were conducted and decrees issued," [Archdiocesan spokesman Jerry] Topczewski said. "The canons governing sale of property were followed meticulously." And yet, he speaks in the exculpatory passive, as when "mistakes were made." Perhaps he does because the article avoids the heart of the controversy, which was that the Archdiocese financed the sale of the buildings to an Assembly of God church. To know that, you had to read this article in our local daily paper. Zahava is the world leader in custom-made kippot for any occasion. The trip home is either uneventful or we're too sleep-deprived from overnight earth tremors to notice. The bus comes for us and we ride to the airport. At check-in, everyone's bags are searched by security. Prensa Libre Sports has the baseball standings. Our Cerveceros are out of the cellar. On the way to the gate, there's a Gallo store, and I pick up a couple more items. Everything I brought to read is in Spanish, and I'm so desparate for something in English I read the airline magazine on the flight out of Guatemala City. We clear customs and immigration and board our flight home at Dallas-Fort Worth Airport. Late afternoon, we land in Milwaukee. We go to baggage claim; all our Gallo golf umbrellas arrived intact. We have our last meal and last prayer service at the orphanage, stack the bedding and sweep our rooms, and carry our luggage downstairs to say our good-byes and wait for our bus. We assume there will be a mission trip next year, but none of us knows for sure that we'll be on it. So while any good-bye to anyone could, for all one knows, be the last, here we're rather more aware of it. The bus arrives and takes us to Antigua, the old colonial capital and main tourist destination in Guatemala Antigua sits at the foot of the volcano Agua , which we could see from the orphanage. Despite it being only twenty-five or so miles away "as the crow flies," it takes over one and one-half hours on the winding roads through several smaller cities and towns. We agree on a time and place to meet and then leave the bus to walk to the central square. Around the square are the cathedral and the former colonial government buildings. In the square are trees, walkways, benches, a fountain, and various vendors. Ken has his work shoes shined for three quetzales, about thirty-five cents, plus tip. Ken and I walk up on of the streets toward the Santa Catalina arch. We stop in a restaurant. The tables surround a garden courtyard, in what I assume is the Spanish style. I order coffee; for the first time in a week, it's brewed, not instant. Ken and I do a little shopping, then meet Martino and Sonja at a cantina on the other side of the square. It strikes me that we never run into non-Catholic mission groups in cantinas. Next year we'll have to remember to drink a toast to them. We meet as scheduled, walk to our bus, and ride to the same convent in Guatemala City. After we're settled in, we have a guest. Frank La Rue of the Center for Legal Action on Human Rights speaks to us on the recent history and current political, social, and economic situation in Guatemala. Mr. La Rue described himself as "progressive" politically, and he spoke from that perspective. From what I've read about Guatemala, I'd say his was a very fair presentation, and that he clearly delineated fact and opinion. He fielded question from our group, probably half from me. I noted that the Catholic Church leadership had been conspicuously involved in human rights, yet the poorest Guatemalans are leaving the Church in large numbers for Evangelical and Pentecostal congregations. Mr. La Rue attributed this to the Catholic Church hierarchy still being perceived as part of the old landed elite, the financing of missionary work by American Evangelical and Pentecostal groups, and the failure of Catholic parishes to develop a sense of community among their members. He discussed how land title and land boundaries are very uncertain, and this is a major source of conflict. The hope is that the registries of both can be modernized so that people can have secure title in land. He also said that free trade, particularly with the U.S., could be very helpful, depending on its terms. For example, he noted that U.S. agricultural subsidies would lower the price of some commodities from the U.S. relative to the price at which they could be produced in Guatemala, so trade in subsidized commodities is an issue. But he went on to say that, leaving aside U.S. subsidies, corn could be grown in Iowa and shipped to Guatemala for half the cost of growing corn in Guatemala. He acknowledged that Guatemalan agriculture had to be mechanized, but this could only be done over time, presumably as non-agricultural jobs were created that could employ the people displaced. Mr. La Rue was aware that his name did seem unusual for a native Guatemalan, which he is. He spent a good part of the 1980's in Washington, D.C., essentially in exile during the height of the 1960-1996 civil war. From his Washington experience, he indicated that Americans underestimate their potential influence on their elected representatives. He was struck by how members of our Congress work at keeping in contact with the people back home. So if an American is concerned about Guatemala, he encouraged going there on missions like ours, and giving Senators and Congressman an informed opinion on U.S. policy. After an hour or so with us, he had to leave. Not long after, it started to rain. Despite the rain, a few of us decided to set out for the brewery a few blocks away to buy some Gallo logo merchandise. As we walked along, the rain turned into a downpour. We entered one building at the brewery complex. They told us that we needed to go to the building next door to pay. This appeared to be the corporate office, with a reception desk, hardwood floors, and busts of the brewery's founders. The receptionist said we would pay there, but then had to get the merchandise at the warehouse. Since we didn't know what they were selling, we decided we needed to see it at the warehouse first. By now it was 4:30 p.m. and everything closed at 5:00 p.m. We couldn't understand the directions, which involved going past "the church" and "the university." Fortunately, a departing employee agreed to act as a guide. He walked his bicycle while one of us held a Gallo golf umbrella over him. Very appealing. As we zigged and zagged, we did pass some university buildings, then a little church with busts of the brewery's founders on the grounds. We got to a security gate at an industrial park and our guide pointed to the end of its road. We walked down the road, through another security gate, and around a warehouse building. In a corrugated steel wall was a little corrugated steel door. We entered. It was the mother lode of Gallo brand merchadise, stacked and racked to a twenty foot ceiling. The desk clerk brought out a cart of samples, polo shirts, baseball, caps, golf umbrellas, beach towels, jackets. The prices were pleasantly, almost unbelievably, low. A polo shirt was a few dollars. He got permission for us to pay there and we pooled our guetzales. Equiped with five golf umbrellas, we stepped outside. The rain had stopped. Back at the convent, we got out of our wet clothes. In my case, that was everything I was wearing. Also soaked was the pocket spiral notebook with my jottings for this log. We had our usual dinner there of Domino's Pizza and Gallo Beer, and went to bed. That was enough adventure for one day. Or so we expected. Several earth tremors woke us up during the night. There's a rumor that we'll have pancakes for breakfast. It's true. Pancakes and syrup. Somehow I was dying to have them, even though back home, I'll go months without having pancakes for breakfast and never miss them. In the carpentry shop, we'have five bunk beds in various states of assembly. We had to do some rework of the rails for the slats that will hold the mattresses. But we'll end the week with about as much of the work done as we hoped. I cut out of work a little early to take a shower. There's water, including hot water, and there's enough pressure that it sprays rather than dribbles from the showerhead. Then I put on my white shirt for the fiesta. In the course of the year, I'll set aside clothes that are almost worn out so that I can wear them on this trip and not bring them back. This white shirt was among this year's. The girls casas and dining hall are across the street. It's raining again as we cross over and walk up to the hall. The tias have prepared the best meal I've ever had here, with items like tostadas that I've never seen served here. One of the desserts is a store-bought banana bread; our group takes it but the kids shy away from it as too unfamiliar. Then it's back across the street the the salon for the show. New this year, the sisters have brought in a marimba band and a little dance troupe. 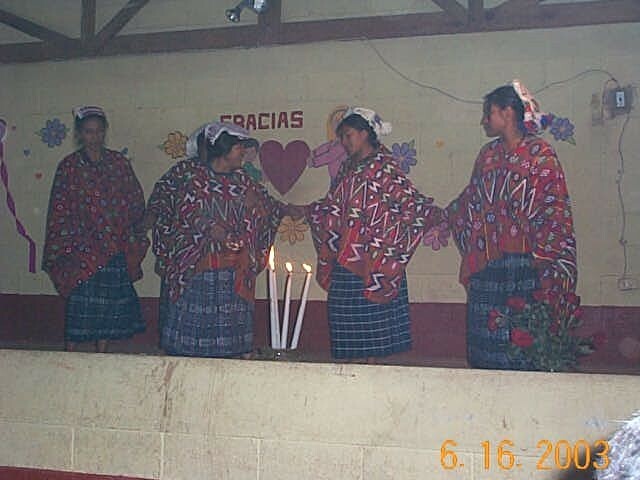 The dancers do what they describe as a traditional Mayan candle dance. The kids perform, by age groups. Some of the younger girls lip-synch and dance to a pop tune. 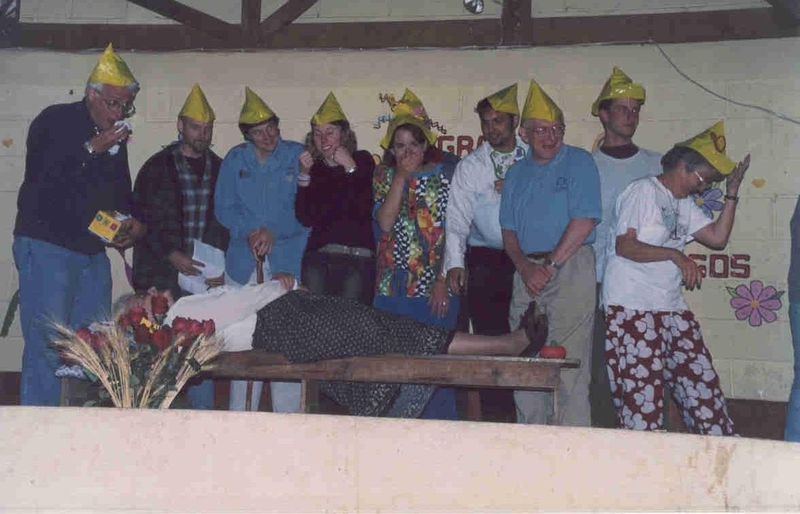 A large group of younger boys and girls do a skit set in a classroom. (Without a translation, I don't quite understand it.) Older boys and girls again perform the Ode to Joy on recorders, but this year they follow that by singing it in Spanish. The oldest boys bring John and Ken on-stage for a game. They each have to bob for little plastic bags of water, then carry them across the stage and drop them in a basket, one for each of them. They then pick up a bag from the other guy's basket and carry it back to the tub. Whoever has the most bags in his basket when time is called, wins. Rigoberto sings and plays guitar, accompanied by David, then by Sara. One song is Friendship Without Borders , which he wrote for us. As he always does, he also plays Let It Be . Here I like it; maybe it's the same phenomenon as the craving for the rumored pancakes. We perform our Snow White skit. It resembles the script I wrote, but the props, costumes, and over-acting make the show. The audience laughs throughout, so we consider it a hit. We're called back on stage to accept thanks for our visit from the staff and the kids, and they present us with some little gifts. Then, still on stage, they have us dance to the Guatemalan National Anthem played on the marimba. It's more danceable than The Star-Spangled Banner . Rigoberto comes back on-stage to sing a couple of Salsa numbers to get everyone dancing into the night. Or at least for another hour or so. In remembrance of Geovany, Jim carved a processional cross and we brought it with us on the trip. The pastor of the Church of Santa Apolonia blesses it after Mass this morning. There used to be a large tree just outside the church entrance. We hear it had a beehive in it and someone decided to try to smoke the bees out. The tree was destroyed by the ensuing fire. We return to the orphanage. There's a rumor that we'll have pancakes for breakfast. It's false. After breakfast, we and the staff and the kids assemble on the playground. Jack leads us in a brief prayer service dedicating the cross. 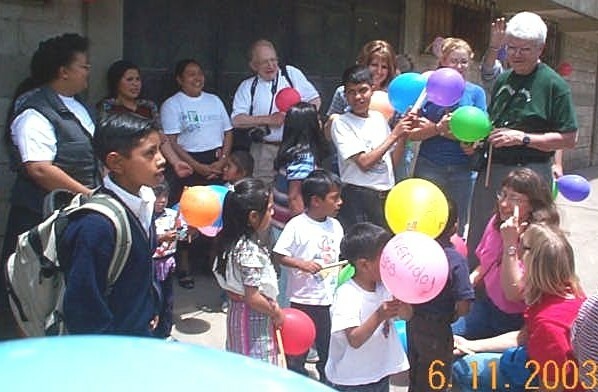 For many years, Geovany was a part of the lives of all of the members of the Friendship Without Borders Mission Team. We looked forward to seeing his smiling face when we arrived and hearing him call our names from across this courtyard. When we would return from a mission trip, people who knew him would ask how he was doing. It was a sad day for us, as it was for all of you, when he died; but he will live on in our hearts. We will miss his calling to us, the smile on his face and the courageous struggle he fought against his illness. We know his spirit lives on here and he is standing with Jesus and running and jumping around heaven, feeling no pain. He is also looking down and watching over us while we are here this week and he will always be watching over Los Hogares. The members of Friendship Without Borders wanted to help keep his spirit present in a visible way and to connect his memory to Friendship Without Borders in a way that will match his handprints that connects Wisconsin to Guatemala on the wall in the computer lab. He carried the cross of his illness with great courage and with the help of his great love of Jesus and Mary. We felt it would be a fitting tribute to have our woodworker, Jim, make a cross in the memory of Geovany that can be placed in the chapel or lead a procession, as it will today as we process to the cemetery. We ask God to bless this cross, that it may be a sign of unity and friendship between us and among all people and may it unite us with Geovany and all the saints, in the name of the Father, Son and Holy Spirit. 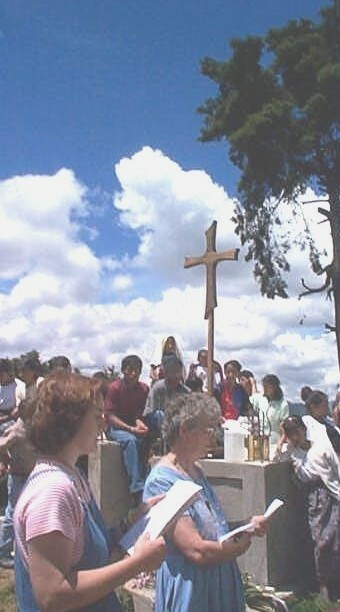 We now humbly present this cross in memory of Geovany to Los Hogares de Santa Maria de Guadalupe. We then begin a procession to the cemetery. 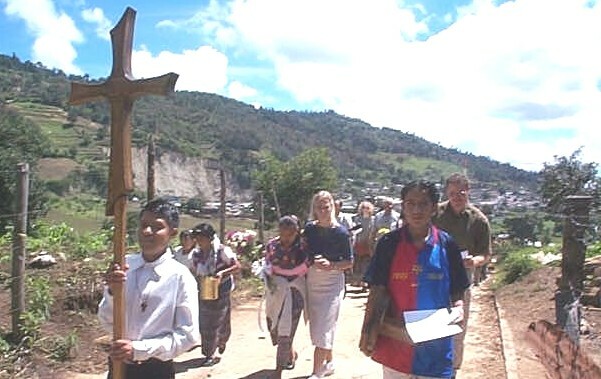 Geovany's younger brother Samuel carries the cross. As we leave the orphanage, one of our group sets of a string of firecrackers, something Geovany would have enjoyed. The cemetery is on a hill just west of town. We take the winding concrete back road to it, singing hymns along the way. There are more firecrackers as we enter the cemetery. We assemble around Geovany's tomb for prayers, a poem, reminiscences, and laying bouquets of flowers. Here are Jack's prayers. We gather to celebrate the life of our friend and brother, Geovany. In life, he gave us courage and love; in his death he gives us strength and hope. May we bear the crosses in our lives with the same dignity and perseverance as Geovany and may we seek the comfort of Mary, the Mother of Jesus, who lives and reigns with you and the Holy Spirit, God forever and ever. You sent your son Jesus into the world that we might have life and live it fully. Through the example of Geovany, may we live a life of faith and trust, bearing our crosses without thought of self. May we take the steps he could not take to make the world one of peace and love. We ask this through Christ our Lord. There are more firecrackers as we leave. No hymns were planned for the walk back, and we're all even more subdued than on the way up. There are more firecrackers as we arrive at the orphanage. Samuel takes the cross to the orphanage chapel, where it will stand when not being used for a procession. By now, it's almost mid-day. Lunch is rice with chicken, mixed vegetables, and papaya for desert. It's a day of rest, and some of us sit with some of the kids while they read. We brought some kids books in Spanish or Spanish and English, like El gato en el sombrero [ The Cat in the Hat ] and bring out the Los Simpson comics. Other kids are using the few pieces of playground equipment or playing marbles. A few of our group have a taste for a soda pop, so we take a stroll around town. We see some of the locals in their Sunday best, clutching bibles, and headed for various Evangelical and Pentecostal services in little churches around town. Loud and spirited guitar music and singing comes from these churches, which are scattered about town. We find a store open and buy our soda pops. Rather than part with the deposit bottles, the proprietor pours the contents into plastic bags and puts straws in each, so we can take them "to go." If we'd been back home, we'd be at my niece and goddaughter Jacqueline's high school graduation. Late afternoon, a few of us ride along in the back of the orphanage pickup truck to one of its patches of farmland. This one is a couple miles west of town and looks like a few acres total. We pull some carrots from the field and pick some tomatoes in the greenhouse. We make it back to the orphanage just as a light rain starts. After dinner, half our group and Frank, Martino, and Sonja decide to go to a cantina. The quiet place nearby doesn't open so we hesitently return to the cantina a few blocks the other direction where we had our adventure last year. But that was a Saturday night, and this year it's Sunday night, so we figure there shouldn't be any problem. There is still a little rain, but that doesn't deter us. Last year the proprietor was very stern and his wife very subdued. Now we see this probably was because, last year, they were sober. The proprietor, a tall, muscular, barrel-chested man, scrounges up enough tables and chairs to seat our party of eleven. We order liter bottles of Gallo and one Coca-Cola . The seating area is about ten by fifteen feet, so we take up almost half the place. The proprietor's children appear to all work behind the counter or in back; they have to wash some glasses so there are enough for all of us. Frank's Coke is warm; I've noticed the local procedure is to restock a cooler by putting warm bottles in front of those last few cold ones in the back. The proprietor decides that Ken looks like Chuck Norris and calls him that the whole time we're there. After we get our first beers, the proprietor brings out a statuette of a brahma bull, a rodeo trophy, and a lariat. He collars Ken and me, pulls out a pocket appointment book with atlas, and seems to be saying he worked as a cowboy in Australia for a time. Next he brings out a soccer trophy, and then a little stuffed squirrel mounted clinging to a branch. In the meantime, the light rain has turned into a tropical downpour. There are only a handful of other patrons, who look a bit wobbly. They prevail on us to include them in some of the photographs we take. Somehow we doubt that we'll send prints back from the U.S. to the cantina to give to these fellows. For such good customers as us, the proprietor orders a couple plates of complimentary hors d'oeuvres. The first are mostly tomato, and aren't too bad. The next seem to be gizzard-based. At this point, we decide it must be about time to leave. It's still raining, but not as hard. Calculating the bill requires multiplying the price of a liter of Gallo by the number of bottles and adding one Coke . This stymies the cantina staff until one of our group brings out a pocket calculator. We pay the bill, say farewell to our hosts, and head back to the orphanage. That evening, we do a run through of our Snow White skit, and people start work on costumes and props. Rigoberto will narrate most of the play, so only a few people have many lines, and most of them are among our better Spanish-speakers. P.S. In October of 2001, my wife and I visited New York City. We went to the World Trade Center site in the morning and The Producers in the afternoon. Today reminded me of that day. The corrugated fiberglass roof in the foreground is for the carpentry shop. On the right side of the courtyard, out of the picture, is the part of the building with our "dorms" on this floor and the library and tutoring classrooms downstairs. Behind us are the sisters' rooms. Below them, there are storerooms. On the ground floor on the left of the courtyard is a leather-working shop where the kids learn shoemaking and related skills. The white building in the foreground is a three story home a block away. Last year we watched a crew mixing concrete on the roof of the second floor from ingredients they carried up ladders. It's common to see reinforcing bar sticking up from the first and sometimes second floor of buildings in Guatemala. That's in anticipation of someday being able to afford adding another story. As you can see, a year later, the third story of this building is still a work in progress. There's a rumor that we'll have pancakes for breakfast. It's false. Breakfast is Vector brand cereal flakes, bananas, and milk. Warm milk. By the pitcher full. For me, it's then back to the carpentry shop. I've been cutting various components to length and helping with putting some of the larger components together with dowels, glue, and clamps. The latter job provides constant reminders of the need to have every piece's dimensions within a close tolerance. I break a little early, finish the script, and give it to Rigoberto to translate it into Spanish. Lunch is leftover chow mein and a cucumber and tomato salad. It used to be that only one boys' casa and one girls' casa had a refrigerator and freezer. Now these are in the dining halls and the Tias use more of the leftovers. One other change with the switch to dining halls is that the meals are made with a propane stove, rather than the wood stoves in the casas. Propane is cheaper (and wood fuel contriubutes to Guatemala's air pollution and deforestation). After lunch I spend some time with Sarita working on the music for our Snow White skit. The sisters have provided their electronic keyboard. We figure out some brief passages of familiar music, mostly classical, to associate, usually, with the main characters' entrances. When we have this outlined, I return to the carpentry shop while Sarita works to put the music in final form. After dinner and an early evening prayer service, we assemble in the women's "dorm" to run through the Snow White script. That done, we have a little party to celebrate two wedding anniversaries, John's and Rita's, and Jim's birthday, which fall during our time in Guatemala. We light some candles and drip some of the wax on the concrete floor to hold the candles upright. Then we break out some Gallo beer and some snacks, things like chips and nuts, that some of our group bought earlier today, and the Sol beer, Santa Rita wine (if we had also found drinks named after John's and Jim's patron saints, we certainly would have bought them), and Venado that I had bought in Guatemala City. Later, on a pretext, we gradually leave for the sister's little kitchen, all but Jim. The sisters have somehow come up with a cake and when Jim finally walks in, the cake is a birthday surprise for him, complete with a few little candles. By now it's 10:00 p.m. and we're all going to early Mass tomorrow, so most of us turn in. There's a rumor that we'll have pancakes for breakfast. It's false. Breakfast is mashed black beans with a side of a sour cream sauce. New this year there is a home-made chile sauce on the table. A sprinkle on the frijoles and they're pretty good, I think. Then it's back to work. I mentioned in that mornings in the carpentry shop we work with the older kids, fourteen to seventeen years old. That's both boys and girls, as you can see in the picture of two of them running lumber through the smaller of the two power planers. Lunch is "chow mein," that is, spaghetti with some chicken and vegetables in it, and a side of squash. That afternoon, I'm working on scriptwriting instead of carpentry. Every year there is a fiesta the night before we leave. Some of the kids and tias (housemothers, literally "aunts") perform. Our group, in turn, performs some musical skit. Last night, the women in our group worked up an outline of our skit: Snow White and however many dwarfs are needed so everyone has a part. I'm given the job of turning this into a script. Martin signs me on to one of the computers in the lab. (So much for a week away from computers.) These appear to be models from the early to mid 1990's. My Spanish is sufficient to figure out the menus in the operating system and word processing software. The keyboard causes more problems; while the keys are the same, what they produce when struck is sometimes different. It's been remapped for typing in Spanish. I work around this; the show must go on! Santa Apolonia has running water. For a few hours each morning and evening. Sometimes the hot water system has enough pressure to reach the second floor where we stay. This is such a time, and I take my first shower since arriving. The water shouldn't be consumed, and when we shower, we have to be careful to avoid getting any in our mouths or eyes or ears. Dinner is a black bean sauce, tortillas, and what look and taste rather like hash brown potatoes or potato pancakes. Out on the playground that evening, the kids start up a kissing game. We stand in a circle holding hands. At the start of the chant, someone starts slapping their right hand to the right hand of the person to their left. This goes around the circle until the chant concludes, and whoever was the last person slapped has to go kiss or hug the person they like. Then they start the process over again. Around 8:00 p.m. we have our group's evening prayer in the chapel. Some of us then go to sleep. Others, young or single or both, hang out on the veranda, chatting and laughing. With the ear plugs, the roosters crowing doesn't wake me until about 4:00 a.m. I doze until 5:30 a.m. when my wife is at the door for our morning jog. The main road splits through town, eastbound one way, and westbound a block north. The eastbound street runs between the main section of the orphanage on the south side of the street and the girls casas on the north side. Santa Apolonia is at an altitude of about 7,000 feet and there is an incline as we go east. It will take most of the week we're here to get acclimated enough to run the whole way. Today we have to walk a ways at the far end of town, as we go past the local school. 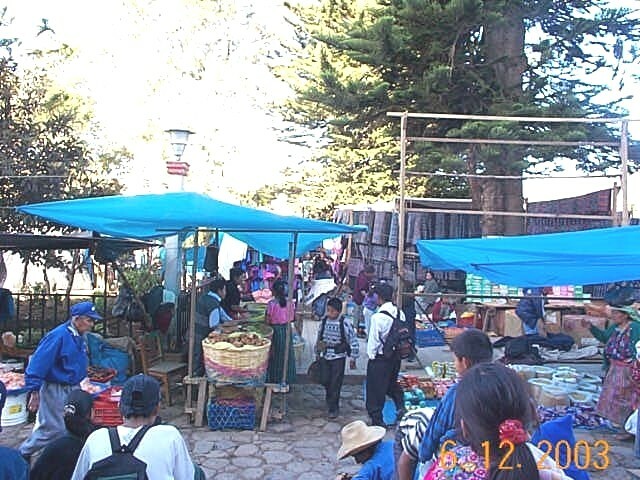 The orphanage grows and raises much of its own food, but also buys some, and today is market day in Tecpan, the nearest medium-sized city. We miss a ride in the orphanage's pickup truck. Rigoberto, a Guatemalan who came from Guatemala with us to again serve as a translator in the medical clinic, agrees to be our guide. We take the chicken bus. If you're unfamiliar with same, here's a photo, another visitor's experience, and a checklist of what you might see on board. On disembarking we pay the fare of one quetzal (about twelve cents) and explore. The market streets are lined with vendors selling produce, meat, clothing, housewares, and flea market antiques/junk. The square in front of the church is likewise full of vendors. Rigoberto leads us on a visit to the church. Some of the alcoves along the walls are empty, whether because the statues were being cleaned or had been stolen we do not know. Rigoberto tracks down a small local art gallery that displays art by regional artists. It's in what might be called a primitivist style and the subjects are taken from the life of the local Mayans. We bought a couple of the less expensive pieces. The gallery sells Christmas cards of some items in the collection, and those items and items by those artists are more expensive, up to 5,000 quetzales, about $650. We run into a number of our group and Martino and Sonja. Our Rita says she saw enough when she went through the open air meet market and is ready to return with us. Apparently there were various intestines on display. We find our return bus and take our seats. Before departure, a few kids board to sell frozen treats or souvenirs, and a few amputees board to beg. Finally we depart for Santa Apolonia and the orphanage. On our return the widows co-op is still selling in the courtyard. These are women were widowed in the civil war, and produce various handcrafts to support themselves. At lunch, beef makes its only appearance in the form of half-inch cubes in a sauce. I'm able to chew them but many of our group give up trying. For side dishes, there are mashed potatoes and a tomato salad. For desert, watermelon. In the carpenteria [carpentry shop], there is one prototype of the bunk beds complete except for the drawers under the lower bunk. We start cutting the components. The idea is to produce parts to specification so that they can be used interchangeably when the beds are assempled. As with last year's project, this is complicated by Guatemalan lumber, which is only rough cut and often green. At some point, most pieces have to be planed to standard thickness. After our afternoon's work, some of us go to the next block to a cantina. This is a quiet place; we have to knock at the door of the family that runs it to ask if they'll open. Dinner is spinach, cold pasta salad, black beans, and tamalitos [little tamales]. We're settling into our routine. We have our evening prayer in the chapel and then go to bed. This is the rainy season, and a few hours later there's a driving rainstorm. Specifically, it drives under the ridge cap of the corrugated fiberglass roof of our room and sprays and drips down on me. I relocate my mattresses and sleeping bag in the computer lab portion of our room. The convent had been the home of a fairly well-off Guatemalan who apparently sold it to the sisters at a depressed price around the height of the civil war. The front of the building presents a windowless wall of brick with steel entrance and garage doors, flush with the sidewalk. Inside, the walls and floors and ceilings are concrete. To the rear, the land falls off into a ravine, and toward the back the convent has lower floors down the slope. The back yard and the rest of the ravine are covered with trees and other vegetation. Below the house is a swimming pool. It was there when the sisters bought the house, the children in their care are brought it to use it from time to time, but they seem slightly embarrassed by it. Further down the slope is a basketball court which appears to never be used. Across the ravine are the large concrete buildings of the university. We breakfast on a veranda overlooking the ravine, on toast or cereal and tea or instant coffee. Our bus won't arrive until later, so Sr. Marietta, who traveled as part of our group of sixteen, leads us several blocks away to the memorial to Bishop Gerardi. Gerardi was serving as auxiliary bishop in Guatemala City and lead work by the Church to compile information on human rights violations during the civil war of 1960-1996. A few days after the resulting report was issued, he was bludgeoned to death in the garage next to his church. The memorial is in the square in front of church and garage. The memorial has a plaque with Gerardi's image and a mosaic with the inscription Guatemala, nunca mas [Guatemala, never again]. On the walk back to the convent, we see some graffiti related to Gerardi and current politics in Guatemala. After we return to the convent, our bus arrives, and we load our luggage again for the trip to Santa Apolonia. But first we stop at the Hiper Paiz, a giant supermarket, for supplies for the orphanage. I also buy some spiral notebooks, which are ruled like graph paper, some Sol beer, which I haven't found sold in the U.S., and some Santa Rita wine, from Chile, and a pint of Venado , a Guatemalan liquor, which I'm told is more or less rum. At the check-out, I pick up three issues of Los Simpson [The Simpsons] comic books. The U.S. dollar is now legal tender in Guatemala, along with the Guatemalan Quetzal. While the store accepted our dollars, the check-out clerk had to have our bills inspected by a supervisor, had to get a calculator to figure the exchange rate, and had to record the serial number of each bill. After all that we realized we could have just paid with a credit card. The trip takes a couple of hours. There is an election in November, and trees and ulility poles are plastered with signs for the numerous parties. The road is generally good, much of four lane divided, but it goes up and down and around through Guatemala's mountains. At last, we turn from the highway to the road to Santa Apolonia and pull up in front of the orphanage. We're greeted by a crowd of the sisters and staff and the kids who aren't in school that part of the day, along with music and firecrackers. As we get off the bus, the kids present us with balloons on sticks; they've written Bienvenidos [Welcome] on the balloons with markers. We haul our luggage upstairs to the two large rooms where we'll be staying. This year our group has more women than men, so the women are in the larger room, the men in the smaller. The men's, about 12 by 20 feet, is cramped because half of it is taken up by the computer lab. There are thin mattresses and bedding on the floor, one for each of us, each with a picture drawn by the kids inscribed Bienvenidos amigo [Welcome friend]. We unload the group duffel bags and distribute the contents to the medical clinic, dental clinic, library and classrooms, and the carpentry shop. For the first time, we aren't assigned to one of the casas [houses] for meals. Since last year, the orphanage converted one of the girls' and one of the boys' casas into comidors [dining halls]. So this year we're divided into two groups and half of us eat with the girls the first few days, then with the boys, while the other half do the opposite. We've arrived while lunch is still being served. In the early years of the Friendship Without Borders mission trip, the meals were tortillas and, in various forms, black beans. As the years have gone by, the variety of menu items has increased. Lunch was chicken and rice and what I'd call a bean sauce on the side. I'm on the construction team within our group, so that afternoon I'm at a meeting in the carpentry shop to discuss the week's work. We'll be building bunk beds. Each of the housing units has four bedrooms with a couple of bunk beds in each. Some need replacing. We'll be working with older kids in the morning and younger ones in the afternoon; the local public school runs in shifts, with the lower grades in the morning and upper grades in the afternoon. There's some time before supper and I find some of the boys, around six to eight years old, playing with a couple of plastic lids. These are about four inches in diameter and look like they're from some kind of food container. I show them some rudimentary Frisbee techniques and we play catch. If I miss a catch, I have to pick the lid up quickly; if I'm squating more than a second or two to pick it up, one of the boys will jump on for a piggy-back ride. Supper is beanie-weenies and rice, although the beans are black beans, not red beans. At our group's prayer service in the orphanage chapel, our group and the staff introduce ourselves to each other. The staff includes Frank and Martino, two young Germans who selected overseas social service in lieu of military service. Martino's name is actually Martin, but it was decided he'd go by Martino to avoid confusion with Martin, who's been with the orphanage several years. Our group's Sara goes by Sarita, a name the kids gave her, which avoided confusion with a second Sara on her first trip with us. Also present is Sonja, a friend (but not girlfriend) of Martino's from Germany, who is traveling through Latin America and has stopped to visit. Finally we go to our rooms, unroll our sleeping bags on the mattresses, put in our ear plugs, and go to sleep. The airlines have reduced the number of flights, and so our itinerary was quite different than prior years [see July 5, 2002 and following]. Last year we had to be at Mitchell Field at 4:30 a.m. This year we arrived at 8:00 a.m. to check in for our 10:30 a.m. flight. We had two bags to check each, one with material for the orphanage, the other with our personal belongings. I dropped off the luggage and went to the parking garage. An addition had been completed since our last trip. I saw the electronic display showing how many open spaces each floor had, but failed to notice that one entrance went to odd numbered floors and the other to even. Having picked the wrong one, I wound up winding down on the helical ramp, exiting, circling the building, and then wound up winding up the correct helical ramp. The amount of time this took was the subject of some comment when I finally arrived at check-in. Unlike prior years, there was almost no line at check-in. This left us with more time than we expected afterward, including time for some group photos in the terminal. 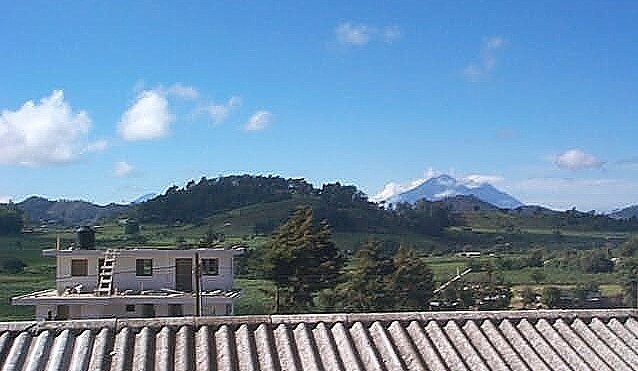 Guatemala claims to produce the best coffee in the world. Most of our time there, however, we will only have instant coffee available, so we buy some real coffee to drink at the gate. Along with reduced flights, the airlines are shifting to smaller aircraft. Our plane had one and two seats on either side of the aisle. Last year's plane was two and two. The pilot came back to tell us about some anticipated rough weather. His aviator sunglasses apparently were no match for my reading glasses, and he commented that "This guy's giving me the 'dare look.'" We landed at Dallas-Fort Worth Airport around 1:00 p.m. Like all airports, it has construction in progress. With the airline schedule cutbacks, we had a four hour layover. DFW's restaurants include a number featuring barbecue. We chose Dickey's, which serves darn good food cafeteria style. I had packed some wine but set out to research whether on a future trip I could just buy it at DFW. There was a wine store near our gate, but it was a bit pricey, expecially considering it only sold wines produced in Texas. Before leaving DFW, I filled my water bottle; once in Guatemala, you shouldn't drink the water. Our flight to Guatemala City had another mission group on it; it always has at least one other group. These folks were from south Texas and were primarily a medical team. They would be making their own meals, things like stew and jambalaya. Mission groups always seem to have some identifying clothing; we had a white polo shirt with our logo, they had a burgundy polo shirt with theirs. This isn't just for esprit d'corps. It helps in trying to track down members of the group in airports. Our plane also had a few young Mormons in their black suits. Our flight left DFW at around 5:25 p.m. Our information was a meal would be served, but this was not so. With the long layover, everyone had eaten enough, out of boredom if nothing else, to get by. Toward sundown, we were flying along the west coast of the Yucatan peninsula. 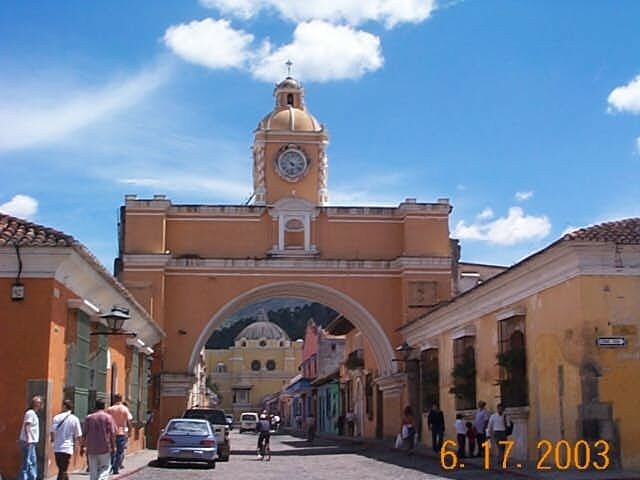 We approached Guatemala City after dark; on prior trips we would arrive mid-day. The city is rather pretty at night. All we could see was the pattern of orange street lights. In daylight, we could have seen some of the rather dismal shacks on the hillsides. On arrival, we cleared immigration without incident and went to the baggage carousel. To haul all the group duffel bags, one of our party rented a large baggage cart, some of the wheels of which appeared to be collapsing under the weight. Sr. Arelina, who heads the orphanage, and Martin, who originally came to the orphanage from Germany as his alternative to military service and who now supervises the carpentry shop, were waiting for us. So was our bus. Last year it was a former Maryland school bus. This year its a Mercedes motor coach. Nicer, but I suspect it also put in many years of service elsewhere before coming to Guatemala. We travel a few miles, at most, to the convent where we would spend the night. The convent is owned by the School Sisters of Saint Francis, who also run the orphanage. We have our usual dinner there of Domino's Pizza and Gallo Beer. I also bring out the little bottles of red wine I brought from home. Jack is our parish's Director of Liturgy and so leads our morning and evening prayer services. Our first is in the convent chapel after dinner. Then we retire. As usual, the men bunk in one room and the women in another, but we share the bath. The toilets are marked for men or women; the showers are negotiable; the sinks are a free-for-all. There's nothing like sharing a bathroom for team-building. 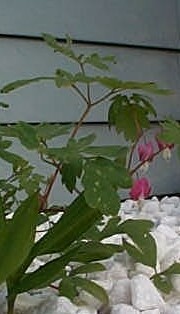 The bleeding hearts are in bloom, which means it's time for our week on the annual parish mission to an orphanage in Guatemala. Maybe I'll again blog retroactively about the trip. This time I might post a few photos. The on-line version of the May 29, 2003 issue of our archdiocesan weekly should be listed among past issues by now. As of this writing, it isn't. Let's see what's in the print edition. Herald 140 going on "30"
Based upon my optimism for the continuation of the Catholic Herald tradition, a tradition that began nearly 140 years ago, I have met with Archbishop Timothy M. Dolan to discuss the immediate future of the Catholic Herald. I heard from him a strong commitment to continue the tradition of the Catholic Herald. What I don't hear is a commitment to continue its weekly publication. I ... also faulted him for allocating such a large portion of his wealth to a cause [founding a Catholic university] far less deserving than Catholic inner city schools or the church's vast array of social ministry agencies serving the poor and the sick. I suggested that these latter priorities were more in keeping with the Gospel. This serves as his prelude to criticism of William Bennett for high stakes gambling. The Herald calls Fr. McBrien's column "Essays in Dialogue." I suggest the more descriptive title "Conservative Sinners in the News." At the ordination of two new priests, Archbishop Dolan praised their native countries. If that's the test, then Mother church might be wondering about the faith of the United States. We attended last night's opening night of the Brandeis Used Book Sale at the Westfield Shoppingtown (the former Old Orchard Shopping Center) in Skokie, Illinois. As usual, they have a couple of circus tents full of tables covered with books. Opening night draws a big crowd. We arrived just before the start, and the line ahead of us was a block long. By the time we got in, enough people had arrived after us that the line behind us was still a block long. It was crowded inside the tents, of course. The cool, dry weather kept it relatively comfortable. If you're there on an opening night and, after a couple of hours, the checkout lines are still short, it's time to leave. By 8:20 p.m. the checkout lines had grown, rather suddenly, to almost an hour. including John Kenneth Galbraith's (heartwarming?) "The Conservative Onslaught"
The sale continues through June 15th. The parish had enough money, and maybe enough prayers, but not enough people. Not enough for a Catholic Church, anyway. It's not unusual that a small parish is closed and its buildings sold. There's an additional twist in this case. Neither Castro nor archdiocesan officials would reveal the purchase price. But [archdiocesan spokesman Jerry] Topczewski did confirm that 30% of the price was being financed by [the successor] Nativity of the Lord Parish at a rate of 7 3/4%. The term is for up to five years or until the purchasing church sells its current building. "How can the archdiocese take money from the parishioners and use that money to help Protestants buy a Catholic church that the St. Joe's parishioners paid for and are trying to save?" From the article, it appears that the successor parish decided to sell the St. Joseph's property but it was the pastor and archdiocese that agreed to having the parish finance the sale. Father Philip Reifenberg, who succeeded another priest as Nativity's pastor last year, said Tuesday that Nativity's parishioners decided before he arrived to sell the St. Joseph's property. Regarding the financing arrangement, Reifenberg said, "I was aware that that was part of the terms of the sale, and I was comfortable with that, and I kept the parish council informed of it." Topczewski noted that the parish was getting a good rate of return, especially considering today's low interest rates. Wayne Schneider, head of finance/administration for the archdiocese, said in a previous interview that short-term financing is better than leaving buildings unoccupied and subject to vandalism. Perhaps Ms. Scaffidi has a different concept of "better" than Mr. Schneider. Mr. Schneider, you might recall, approved the $450,000 settlement with Paul Marcoux, presumably considering that the better course. As a result of the subsequent scandal, the job of approving such settlements was given to the Archdiocesan Finance Council, as explained in this article. Among the members of the Finance Council listed in the article is Fr. Phil Reifenberg. Coincidentally, this morning's newspaper has this article about the gourmet coffee business of a distant cousin. Here's their web site. Order some Guatemalan. Here at my site, I've added a Berres Genealogy page. Bringing to mind a line from Doonesbury circa 1970s, not long after Roots first was shown: "Hey Clyde, you figure out who your father was yet?"